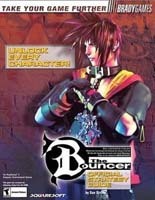 BradyGames The Bouncer Official Strategy Guide contains an in-depth walkthrough for each character's storyline in the game. A complete list of character moves is provided. Detailed fighting tips, boss strategies, and enemy stats for Team Battle, Versus, and Survival Modes. Secrets are revealed to unlock every character in Story Mode and access alternate costumes.